It is with a bittersweet purpose that I share this news with you today. 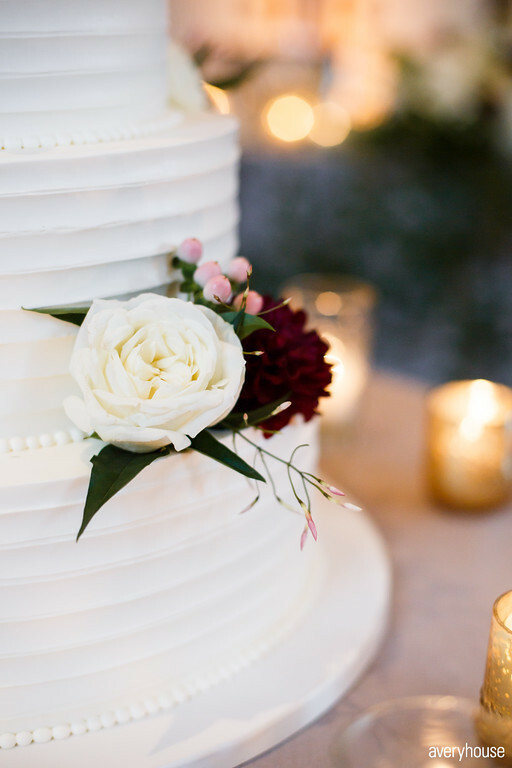 During this holiday season of gratitude and reflection, I have been carefully examining my life, both from a business and personal perspective, and have made the difficult decision to close Elysia Root Cakes permanently January 27, 2018. 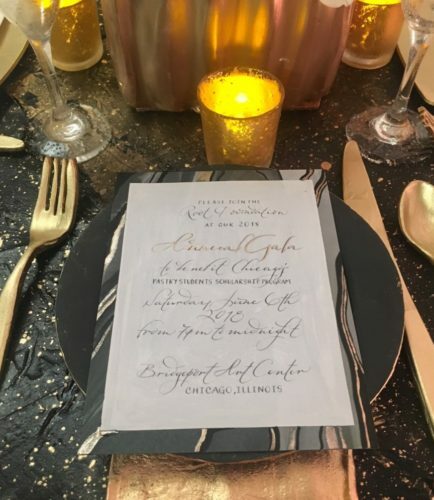 Please know it has been an absolute privilege and honor to be part of the Chicago wedding industry and to play a role in thousands of beautiful celebrations of love, life and family. I am so grateful for the wedding community, and the friendship and support that both clients and colleagues have shown me over the years. In the years to come, I will look fondly back on many moments- including our move to the cake studio space at 1939 W. Fulton Street, our regular Treat Tuesday team lunches, having not one but two cakes featured on season 4 of Fox’s hit show, Empire, and being a part of the 100th wish granted by Wish Upon a Wedding. I still eagerly anticipate our upcoming episode of Cake Hunters, set to air in 2018, which was shot during PartySlate’s second anniversary celebration. This has been a deeply personal decision made at a time when the business couldn’t be stronger, but the needs of my family have grown, and I can’t let those needs cause us to sacrifice the quality of our products and services for which we are known. 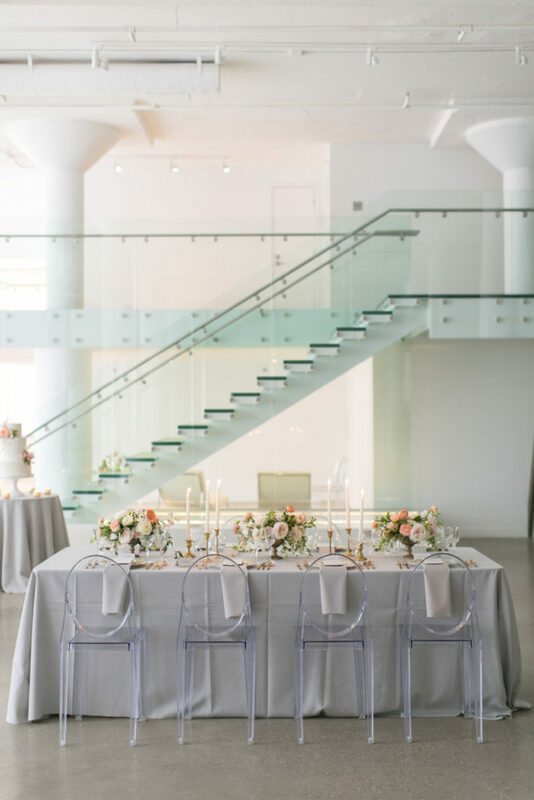 For our clients, we will continue to ensure that the transition is as smooth as possible. 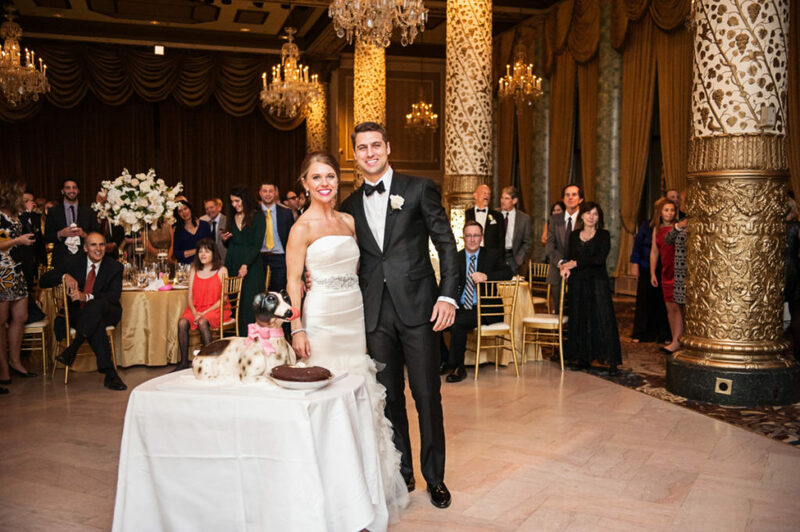 We are pleased to recommend Sugar Fixe Patisserie to Chicago couples seeking referrals. We have complete confidence in our highly reputable colleague and are grateful that they are willing to help fulfill our client’s needs during this transition. 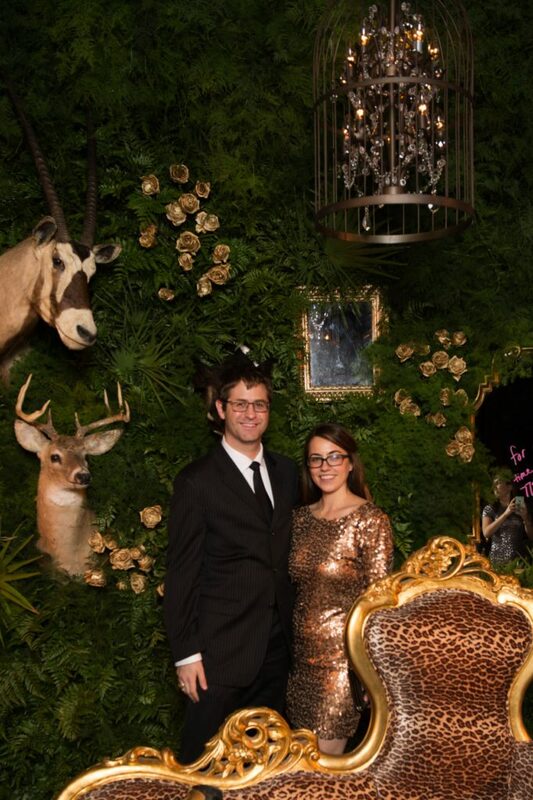 I am grateful to Nate Root, my husband of 12 years, for his unwavering support. Without him, Elysia Root Cakes would never have existed. I am also grateful to my amazing employees, past and present, for being so dedicated and professional and believing in our core values and mission. This chapter of my life and business may be ending, but I take with me friendships and memories that can never be replaced. I am grateful to you all for following me on this great adventure. 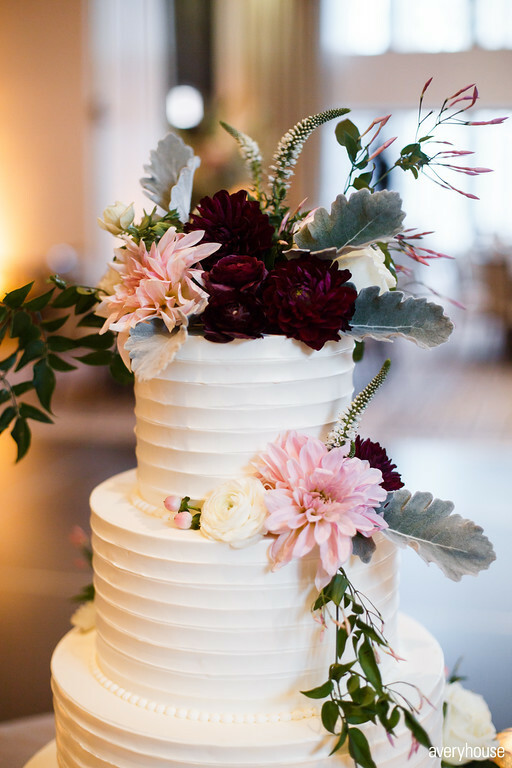 This week, meet Danielle Leahy, the Elysia Root Cakes team’s Cake Artist and Baker! 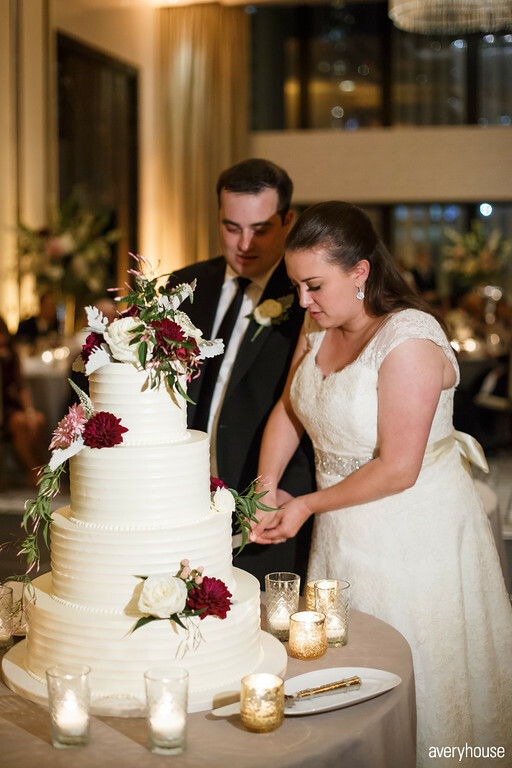 Danielle joined the Elysia Root Cakes team in the past year. Danielle moved to Chicago from Washington D.C., but is originally from Pennsylvania. 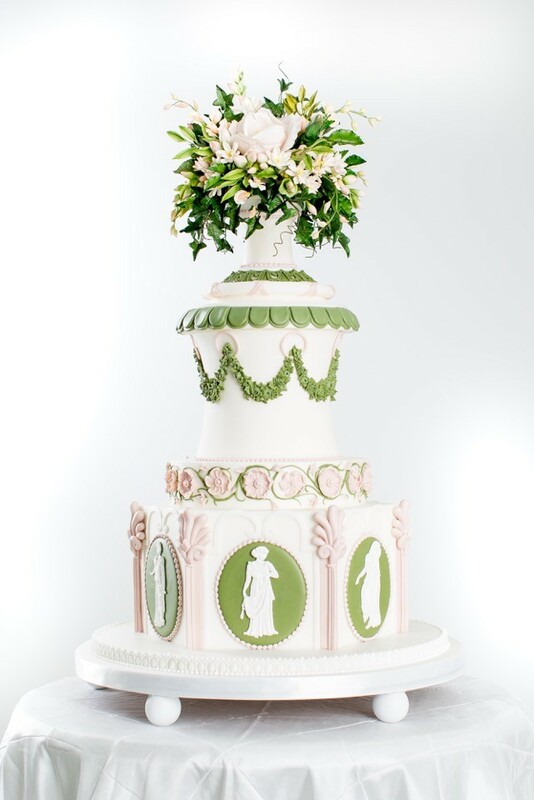 She received her degree in Baking and Pastry Management from The Culinary Institute of America in New York. Danielle interned at Pink Cake Box in New Jersey and also has a strong pastry background, having been on the pastry team at the Rosewood hotel in Washington, D.C. We recently sent Danielle to 3 days of Cake Carnival in Kitchener, Ontario, Canada to learn from six amazing cake artists and to further develop her own skills. 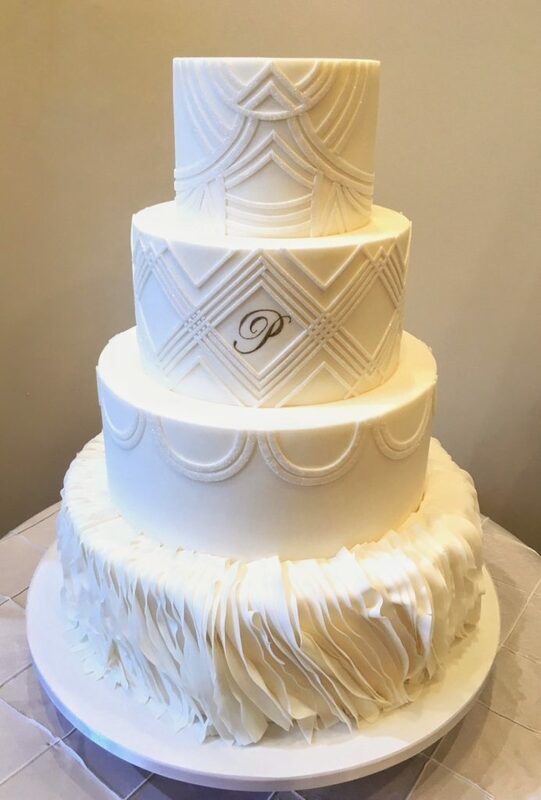 She spent 3 days creating this beautiful wedding cake that showcased a variety of different techniques. 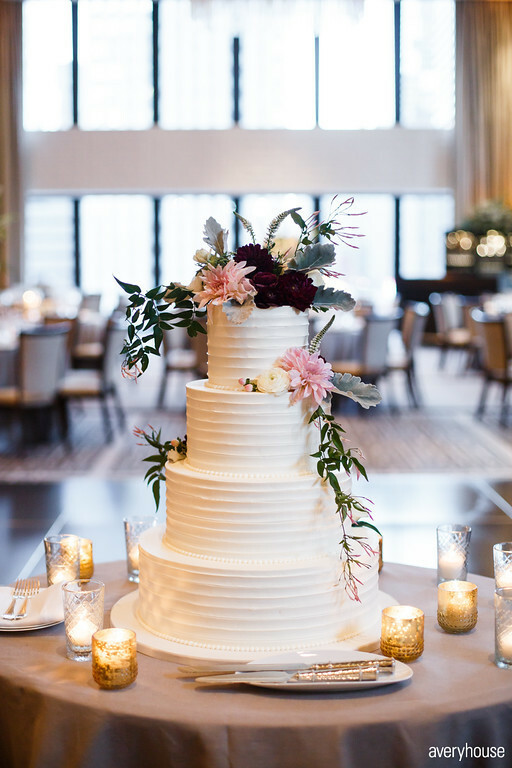 Wedding cake created by Danielle. Photo courtesy of Danielle Leahy. Read on below to get to know a little more about Danielle! Before work at Elysia Root Cakes what was the most unusual or interesting job you’ve ever had? In high school I took phone orders for a company that sold plants and seeds. 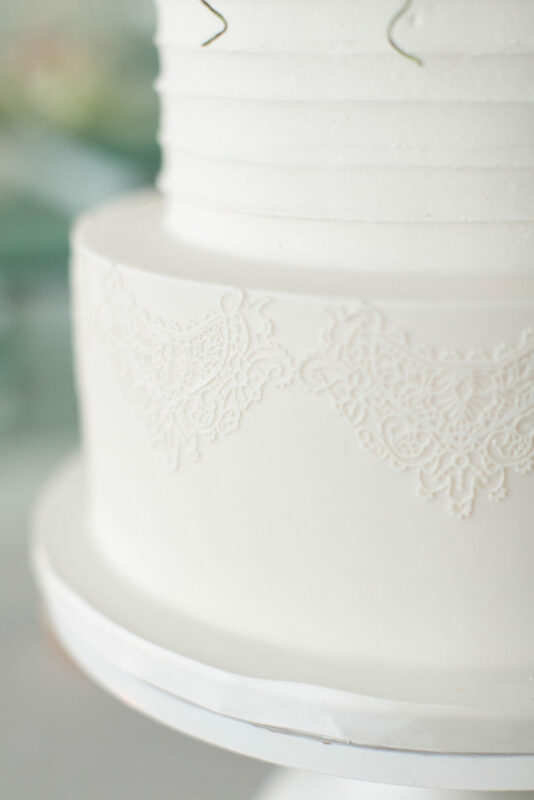 What do you like most about working at Elysia Root Cakes? I like that we are always doing new and different techniques and learning every day. 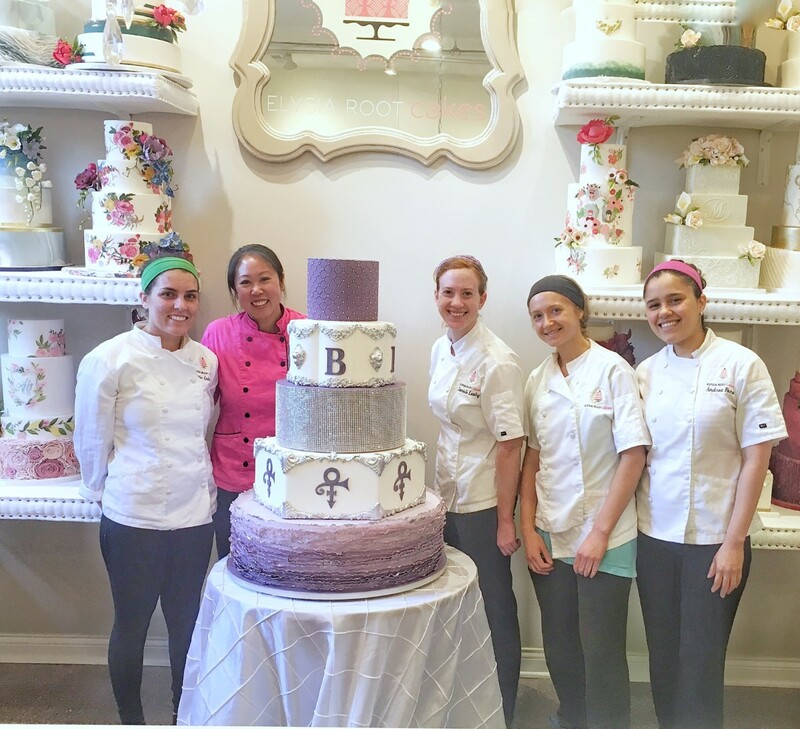 Danielle pictured with the Elysia Root Cakes team and the cake we created for the TV show Empire for the Prince tribute episode. 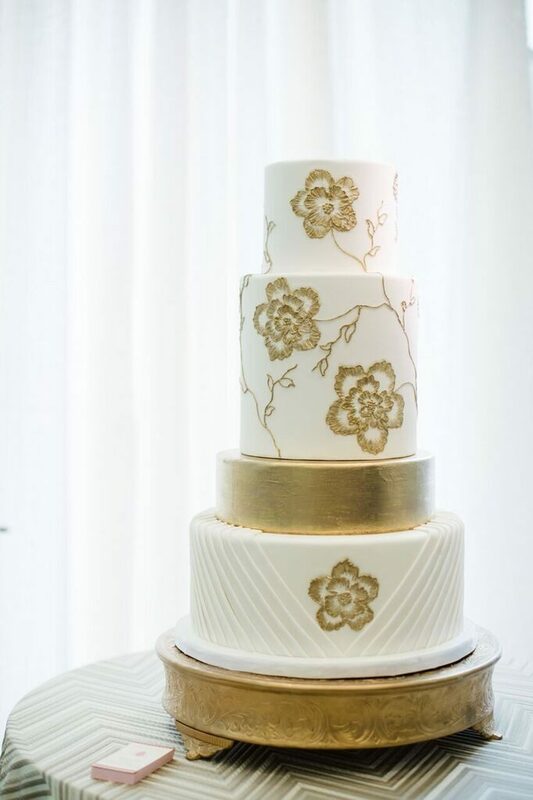 What has been your favorite project at Elysia Root Cakes? My favorite project so far has been the monkey baby shower cake. 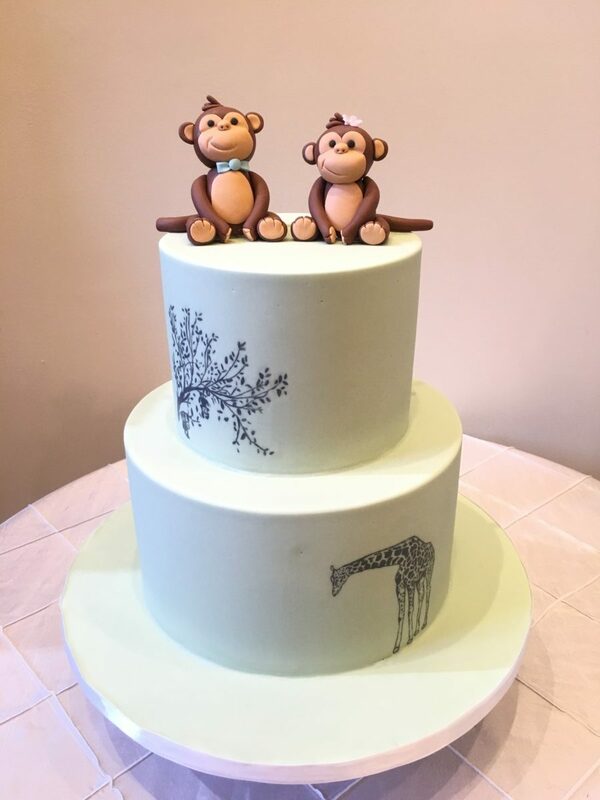 Hand painted baby shower cake with hand made fondant monkeys that Danielle helped to create. 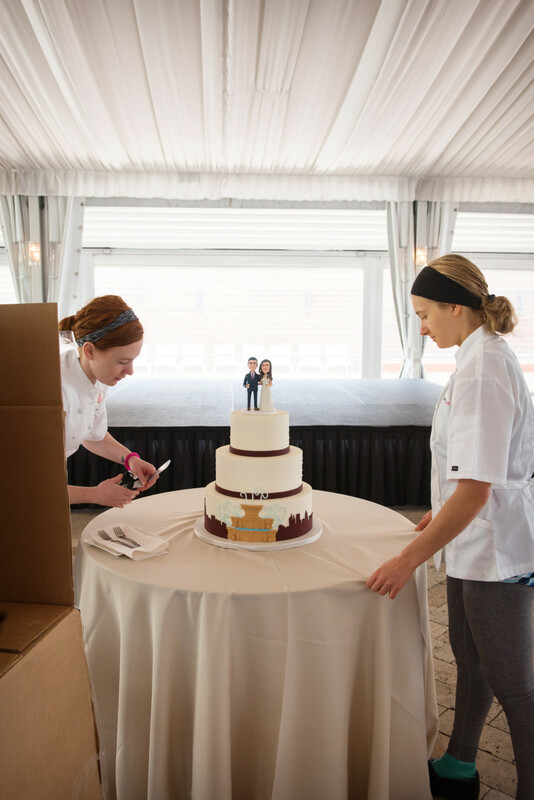 Danielle and our intern Maddie, delivering a wedding cake. 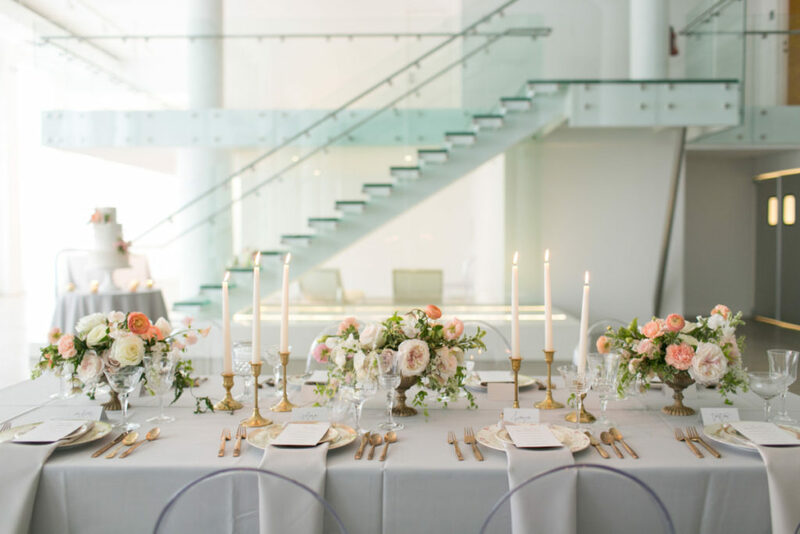 Photo by Jason Kaczorowski Photography. 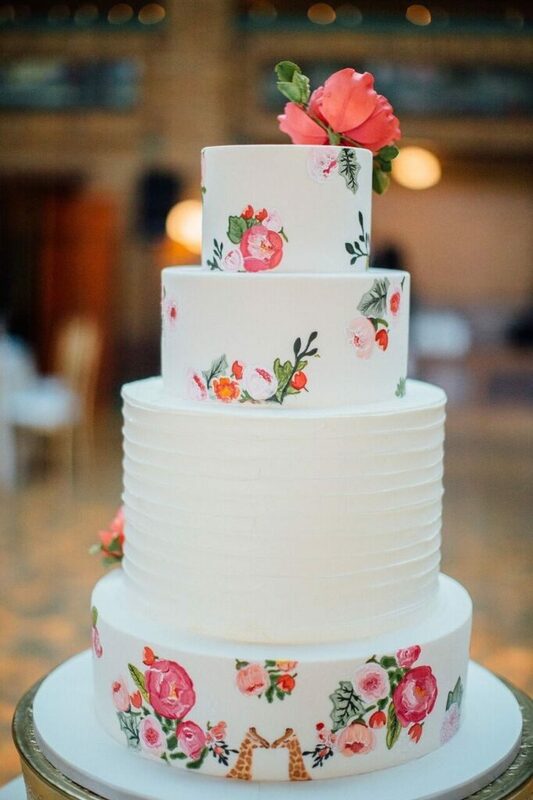 Thanks for taking the time to learn a little about Danielle, Elysia Root Cakes team’s Cake Artist and Baker! 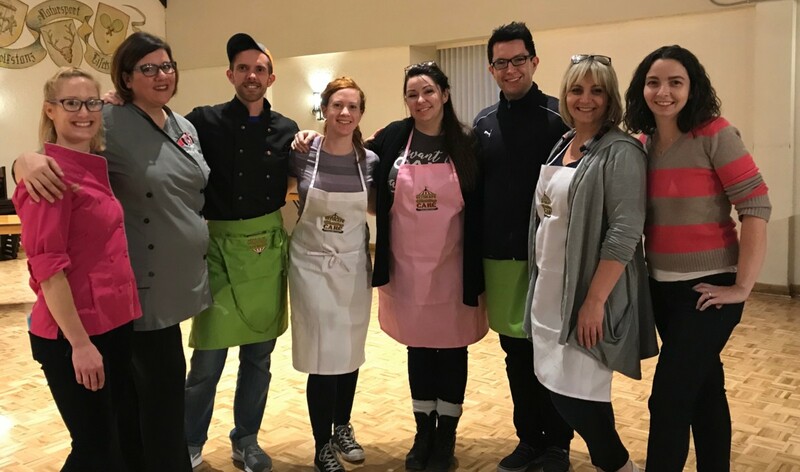 Danielle pictured with Courtney Clark, Sarah Myers, Joshua John Russell, Avalon Yarnes, James Roselle, Susan Trianos and Chrissie Boon. Photo courtesy of Danielle Leahy. 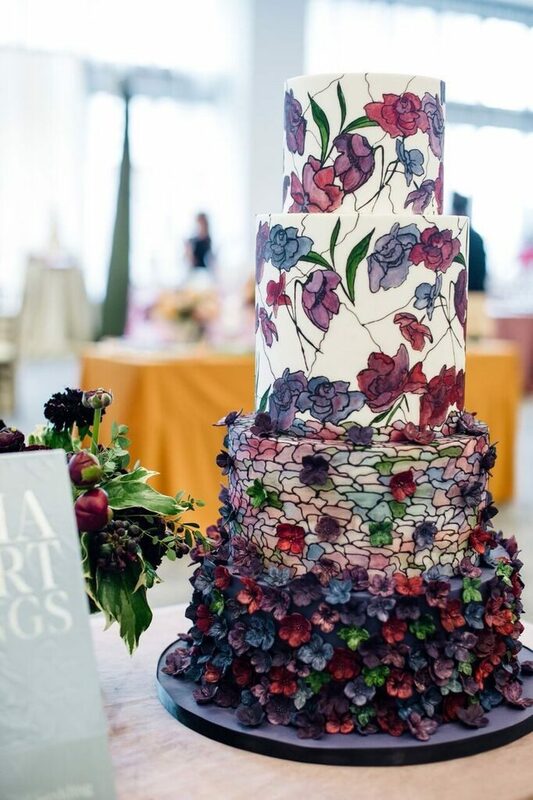 This week, meet Monica Anderson, the Elysia Root Cakes team’s Senior Cake and Confectionary Artist! 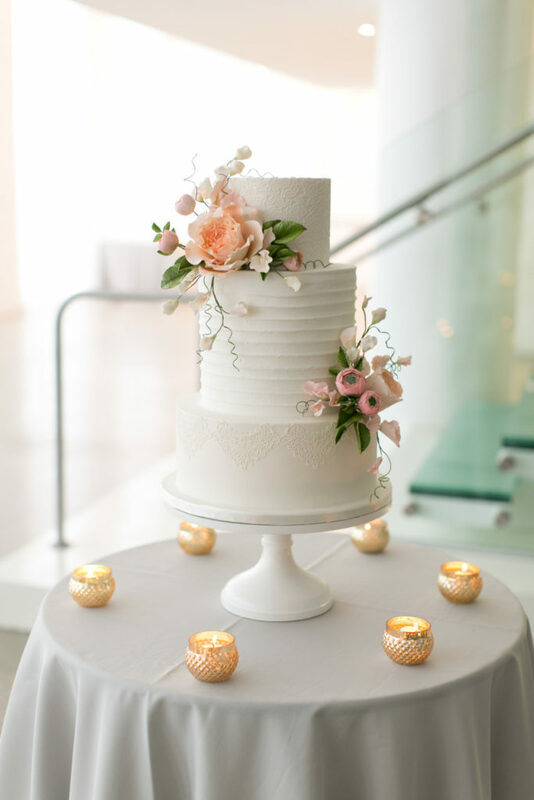 Monica has been an integral part of the Elysia Root Cakes team for the past four years. We previously profiled Monica back in 2015. Monica is from Naperville, Illinois and now lives in the River North area. 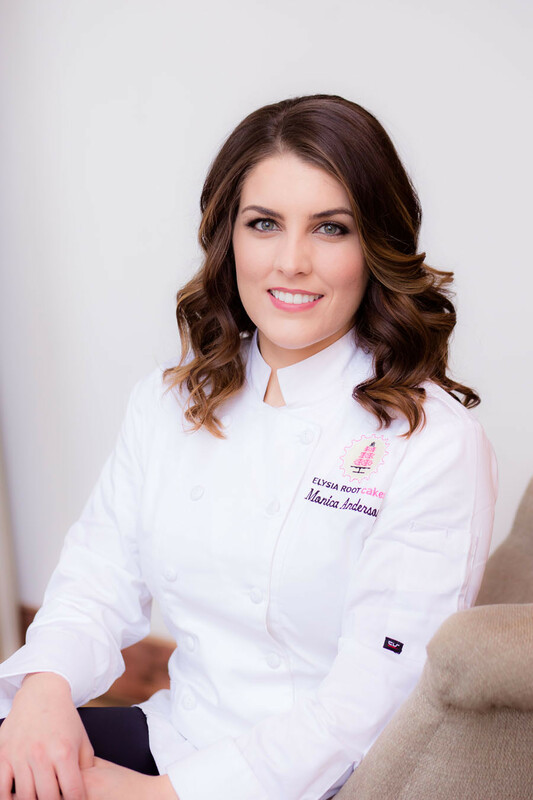 Monica has a degree in Baking and Pastry from Kendall College. Photo credit: Rebecca Marie Photography. Hair by Livia Caporale. Make-up by Andie Cumber. 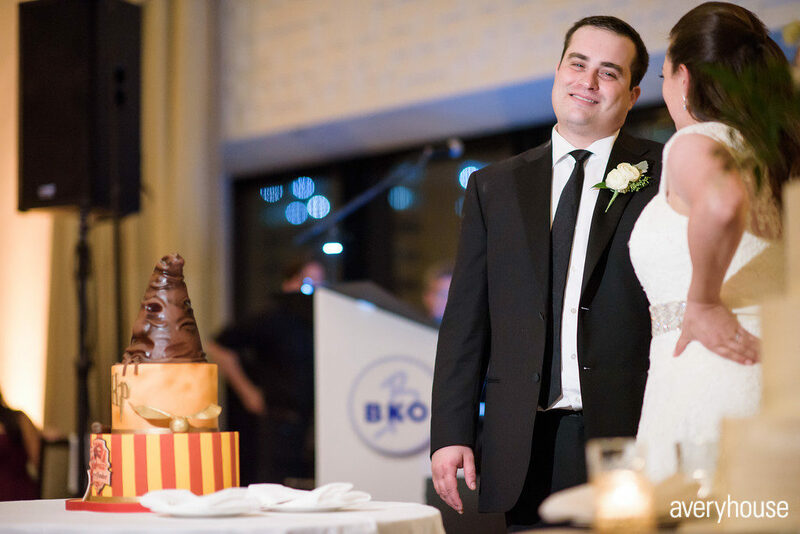 Monica worked at various bakeries in the Chicagoland area before joining our team in 2014. 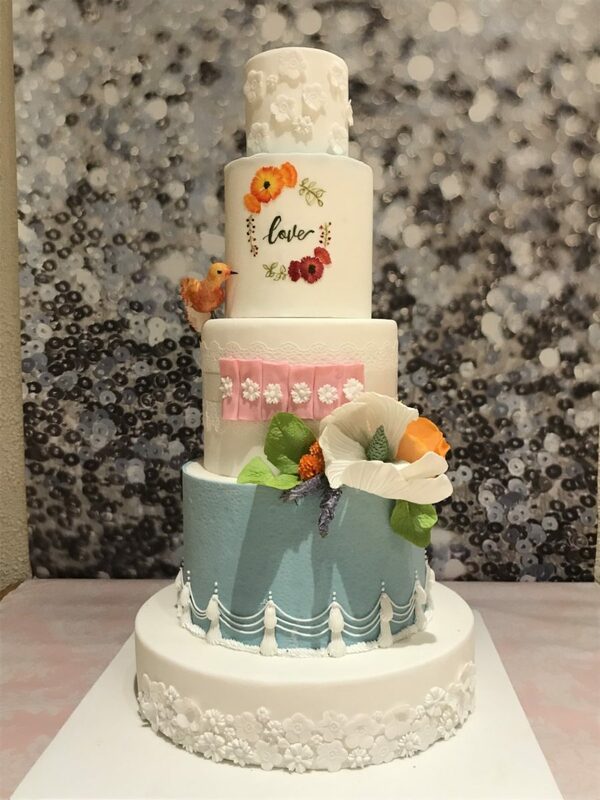 We’ve loved seeing her develop her skills and become an even more amazing cake artist during her time with us. 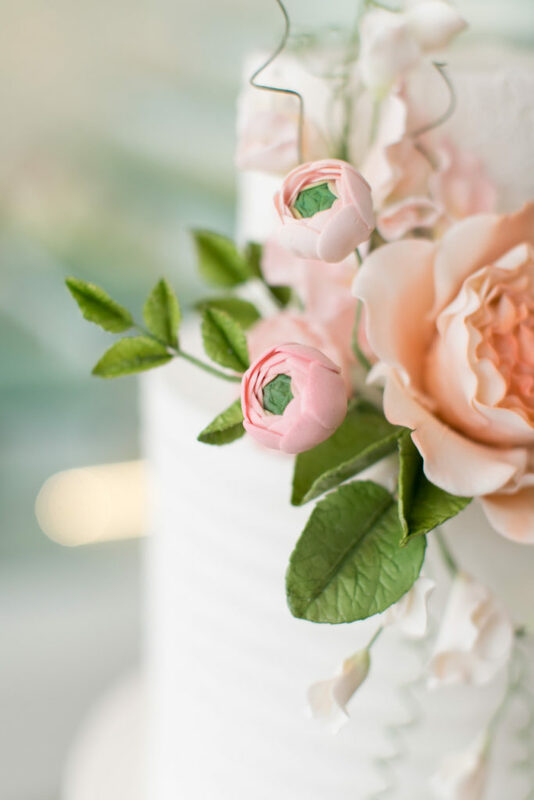 We are happy to have encouraged Monica in developing her skills by sending her to learn from some amazing cake artists such as Mark Seaman, Nicholas Lodge, Mike Elder, Mary Jo Dowling, and Colette Peters. 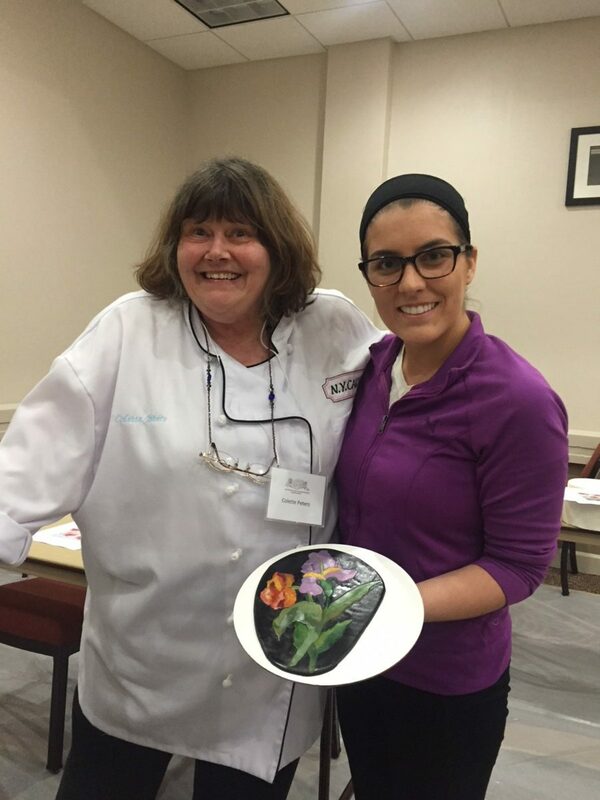 Monica in class with Colette Peters during Florida ICES mini-classes. 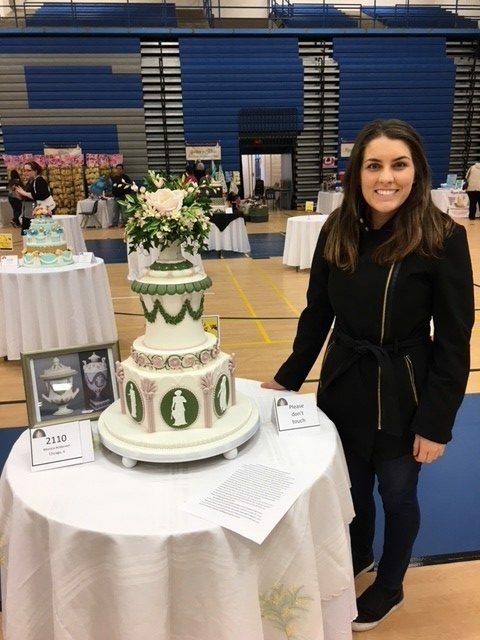 Monica recently competed in her first cake competition and took 2nd place in the Professional Wedding Cake Division at the National Capital Area Cake Show in Virginia. We’re super proud of her accomplishment. Read on to learn a little more about Monica! 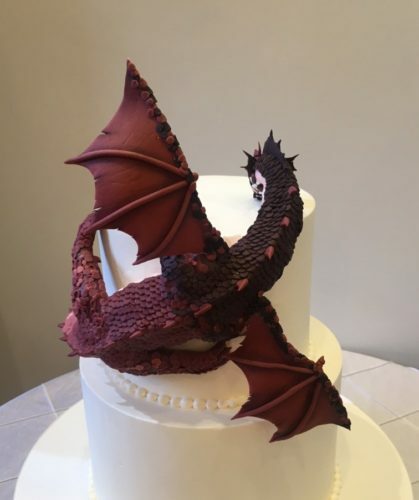 What has been your favorite project at Elysia Root Cakes? 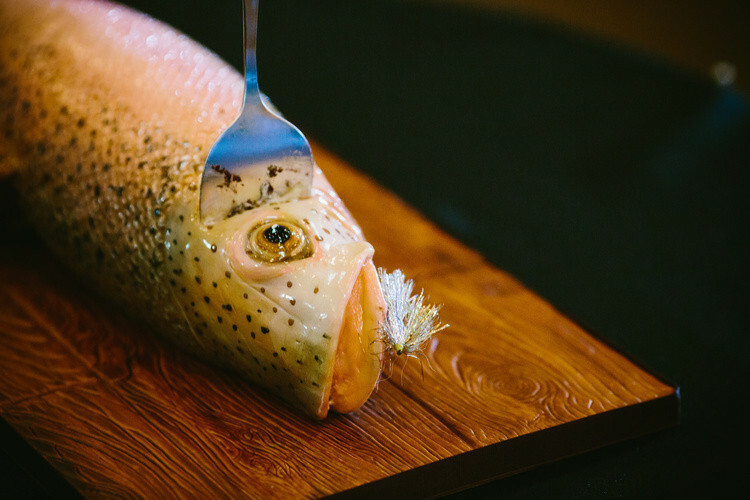 My favorite project thus far at Elysia Root Cakes has been the Rainbow Trout Groom’s cake that we created in 2016. What is your proudest moment at work? 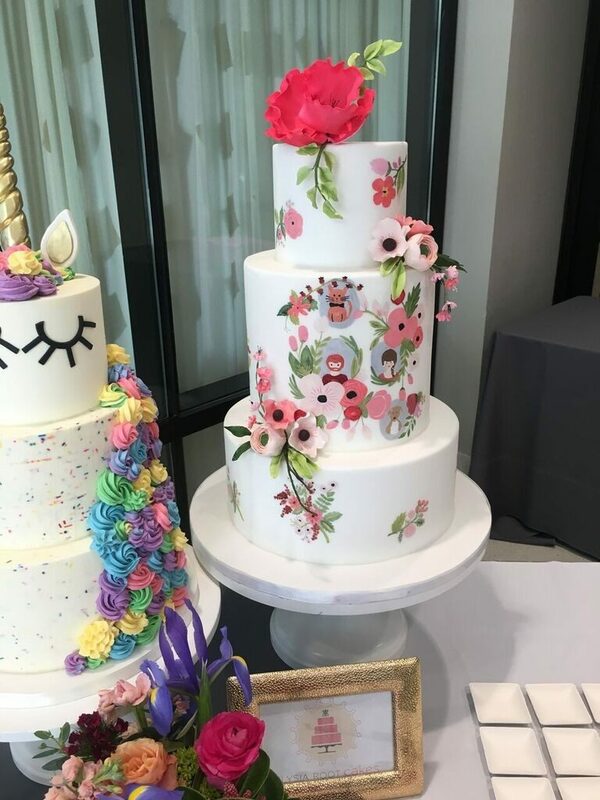 My proudest moment at Elysia Root Cakes is when I came in 2nd in the Professional Wedding Cake Division at the National Capital Area Cake Show. What is your favorite thing to do in Chicago? My favorite thing to do in Chicago is to go to all of the amazing museums. What phobias do you have? I have a phobia of bugs crawling all over me! What did you want to be when growing up? When I was a kid I wanted to be an architect. Monica and Elysia on an 2016 Icing Smiles delivery for Dulce’s 1st birthday to Almost Home Kids. What is an ability you wish you had? An ability that I wish I had is teleportation. What is the one thing you cannot resist? Chocolate and Peanut Butter! 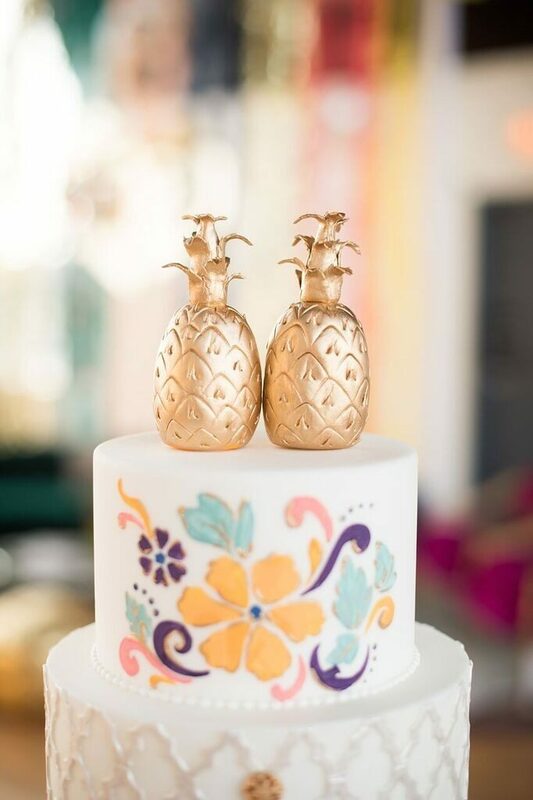 What is the favorite part about working at Elysia Root Cakes? 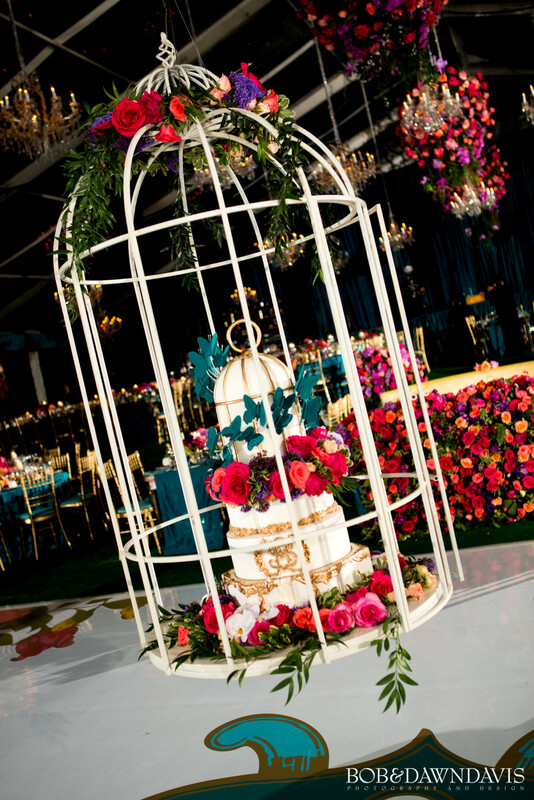 The ability to be creative and to create beautiful cakes for people to enjoy on a special day. 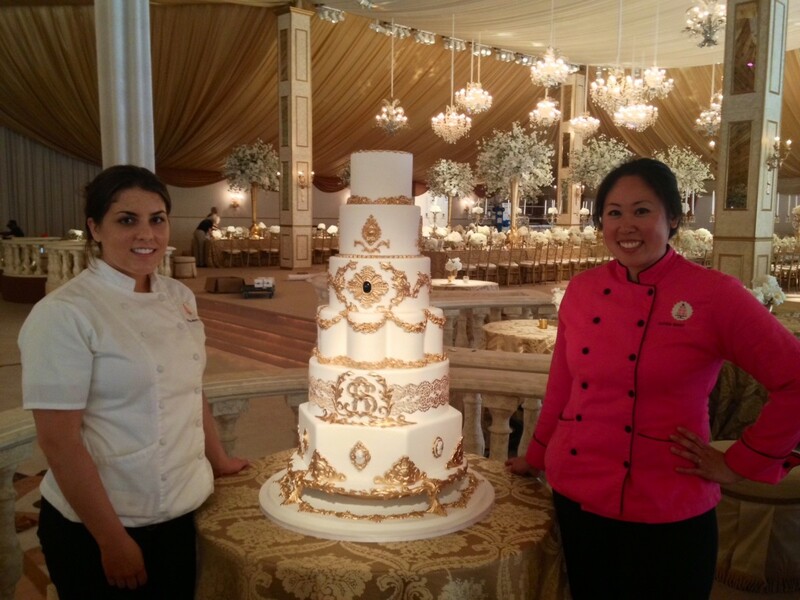 Monica and Elysia on a wedding cake delivery in 2014. 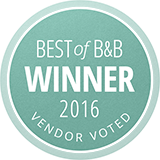 Best vacation place you’ve been? The best place I have traveled to was Italy. What celebrity do people think you look like? When my hair is straight, people think I look like Kate Middleton, the Duchess of Cambridge. 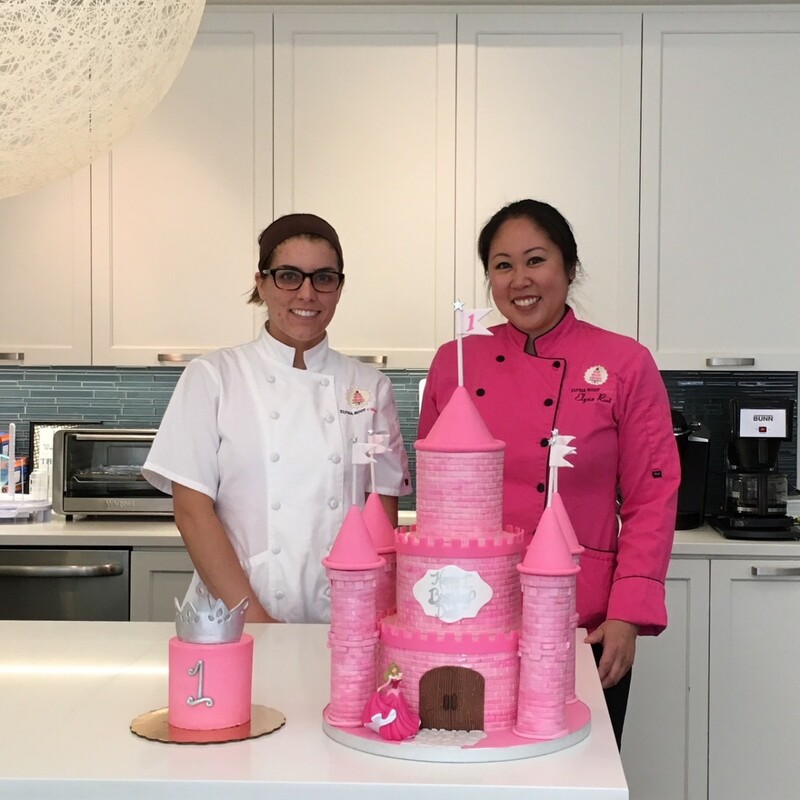 Thanks for taking the time to learn a little about the Elysia Root Cakes team’s Senior Cake and Confectionary Artist! 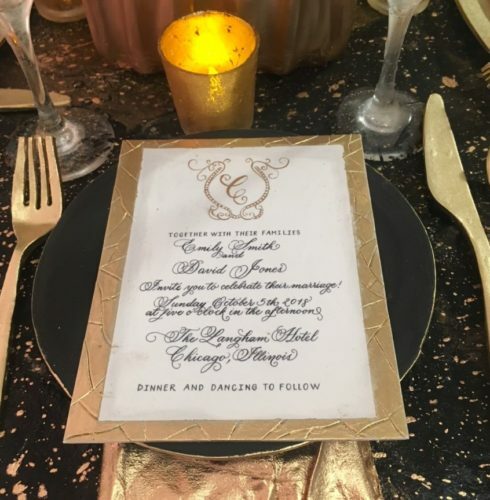 Check out more from Monica on her instagram. 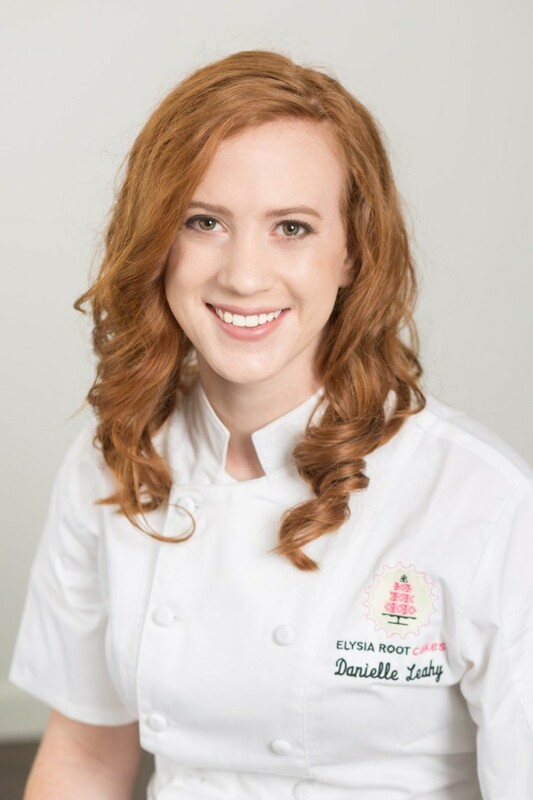 Meet Kelly Dull, the Elysia Root Cakes team’s head baker! Kelly is in charge of the deliciousness that comes out of the Elysia Root Cakes’ kitchen each week. 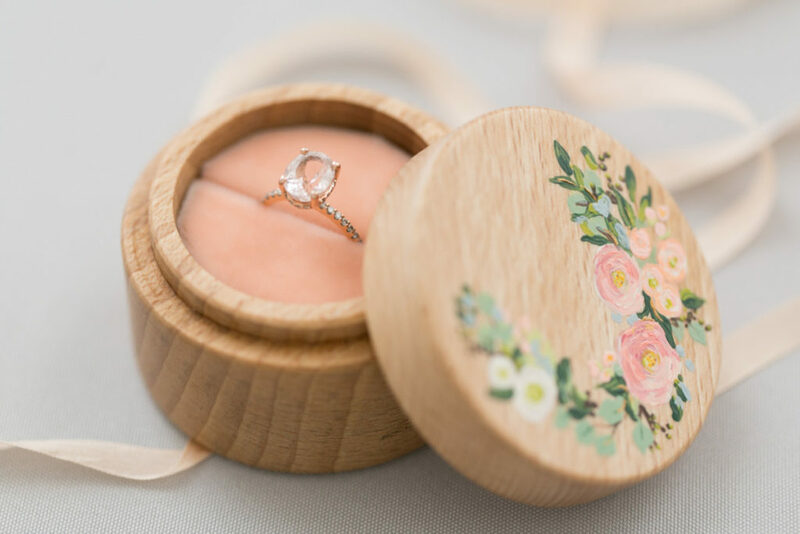 While Kelly is originally from Elyria, Ohio right outside of Cleveland, she has lived all over the United States on both coasts, from Santa Monica, California to Brooklyn, New York! 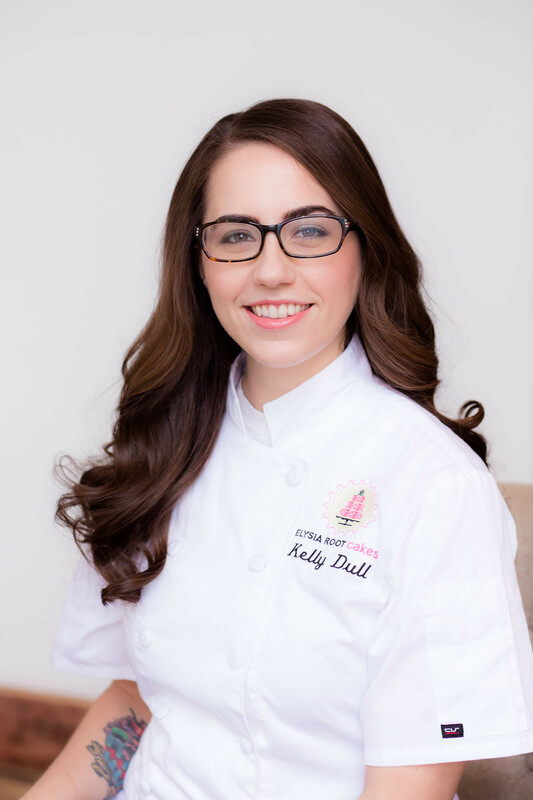 Kelly received her Bachelor of Science in Baking and Pastry Arts from Johnson & Wales University in Providence, Rhode Island. Headshot by Rebecca Marie Photography. Make-Up by Andie Cumber. Hair by Livia Corporale. 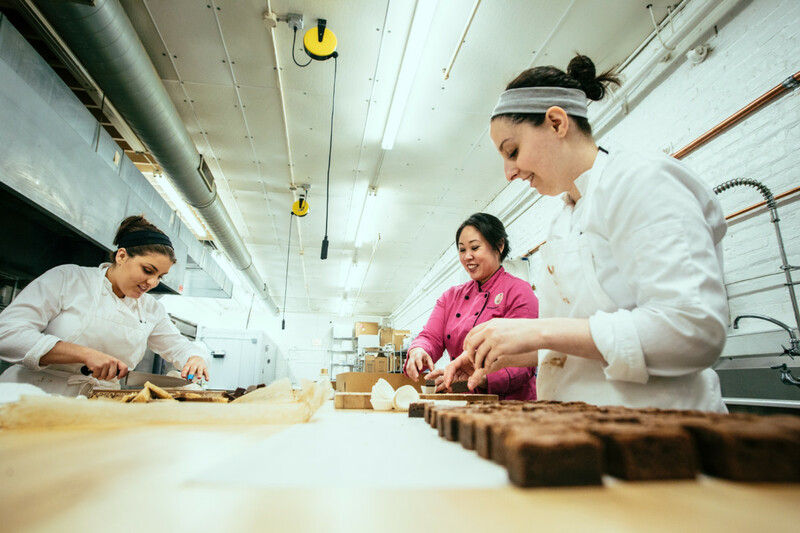 Kelly is not only the Elysia Root Cakes team’s head baker, but she is also a successful culinary instructor and you can find her teaching classes at Give Me Some Sugar in Roscoe Village, Sur La Table in Skokie, and Read It & Eat in Lincoln Park. We are grateful to have such a talented person on our team! 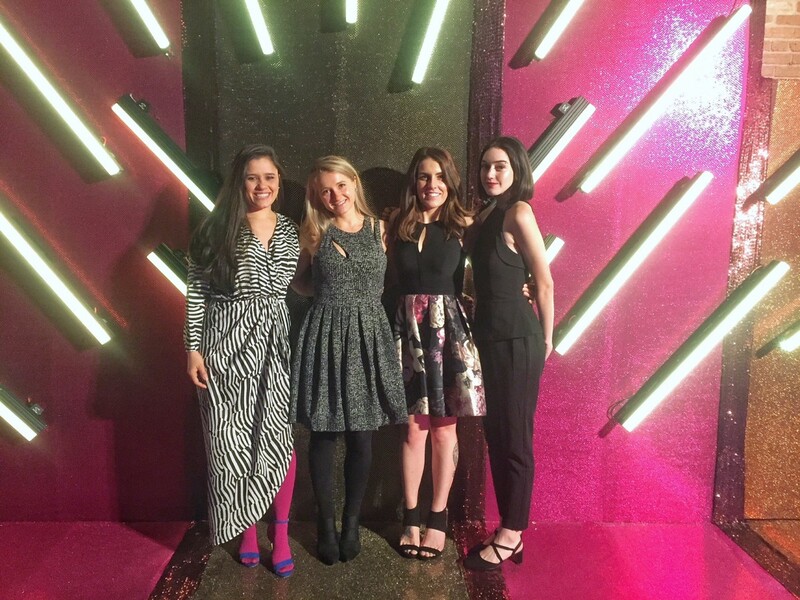 Read on to find out a little bit more about Kelly! 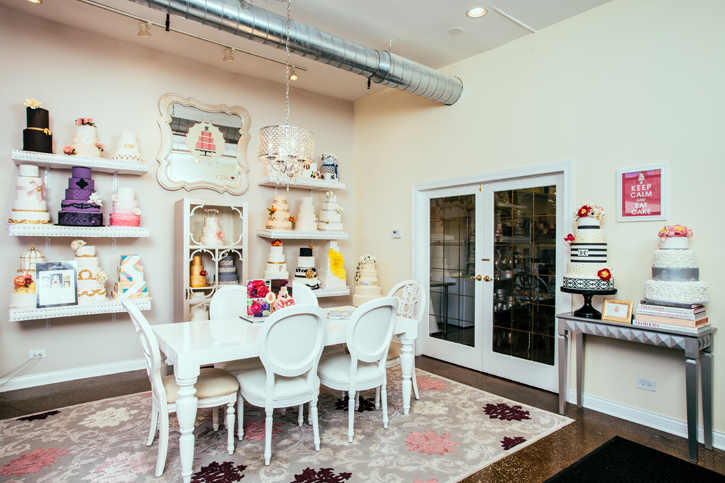 What do you like most about working at Elysia Root Cakes? I love that we have so many opportunities to push ourselves and to learn and grow. We are always trying to be better than we were and that’s exciting. 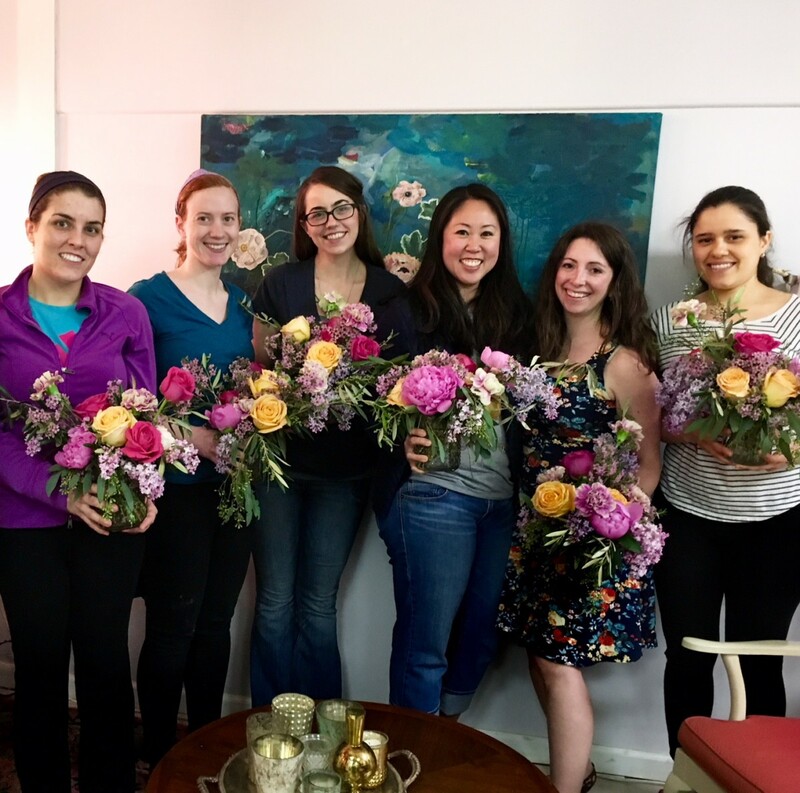 The Elysia Root Cakes team at a fresh floral arranging class given by fellow Green Wedding Alliance member, Jori from Fab Flora Chicago! 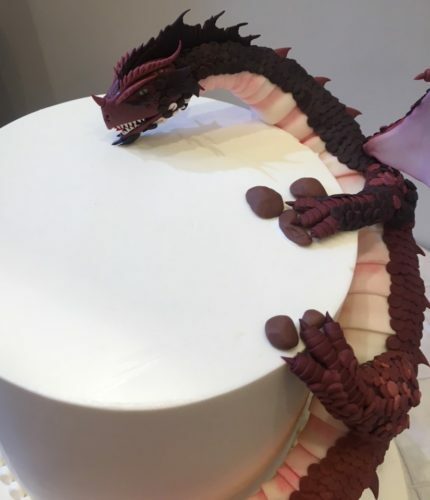 Before working at Elysia Root Cakes, what was the most unusual or interesting job you’ve ever had? I helped a good friend open and run a bakery in Providence, RI. It was one of the most challenging, exhausting, exciting, and rewarding things I’ve ever done. What is the weirdest job you’ve ever had? I was a car hop waitress at a place called Dog N Suds for four summers in high school. Tell us something about yourself that would surprise us: At age 26, I spent 4 months on a solo road trip around the entire United States. Kelly and Michelle delivering 240 (!) mini-cakes in 2016. What is your favorite movie and book? My favorite book (besides the Harry Potter series!) is “The Things they Carried” by Tim O’Brien and favorite movie: A League of Their Own. What did you want to be when growing up? 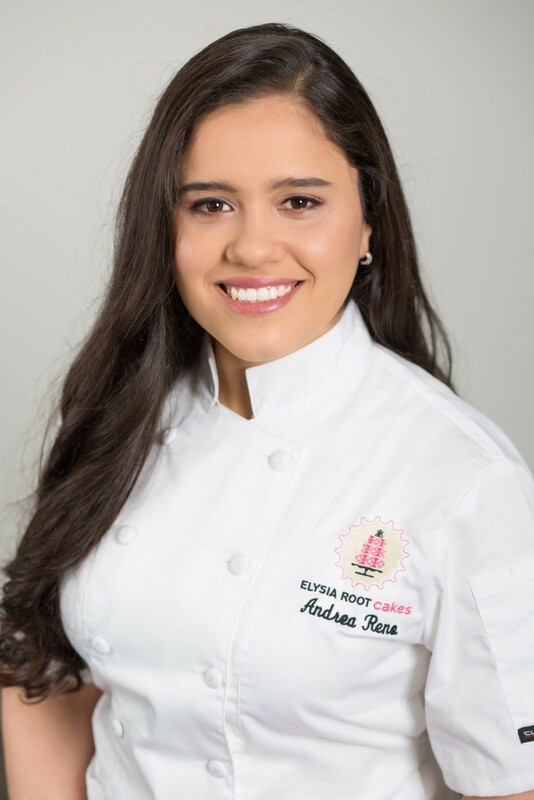 A veterinarian until age 14, then a pastry chef/baker! What is the most important thing you have learned in the last five years? Self-care and how to say no to people. What is your hidden talent? I can juggle! 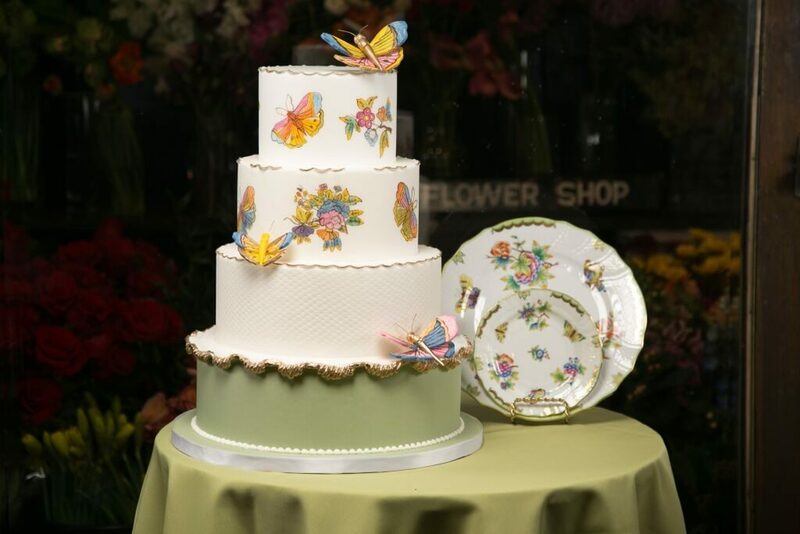 What has been your favorite project at Elysia Root Cakes? 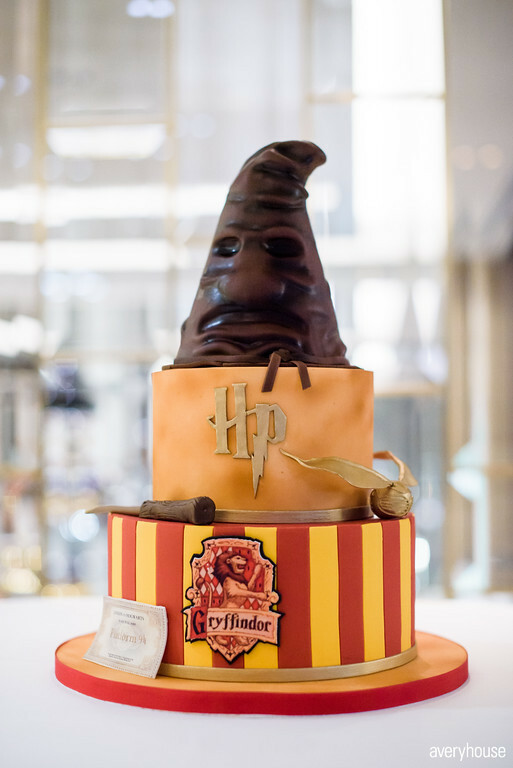 The Harry Potter themed cakes! 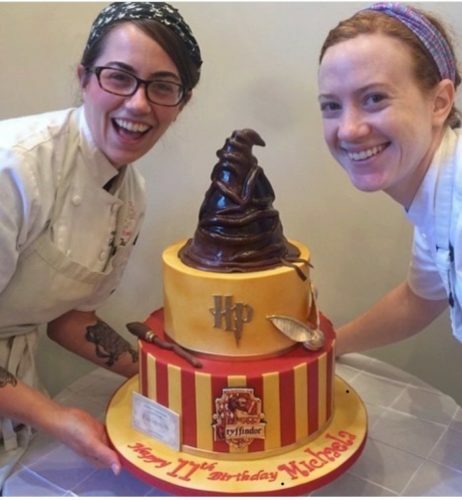 Kelly and Danielle with one of two Harry Potter themed cakes we’ve had the opportunity to make. 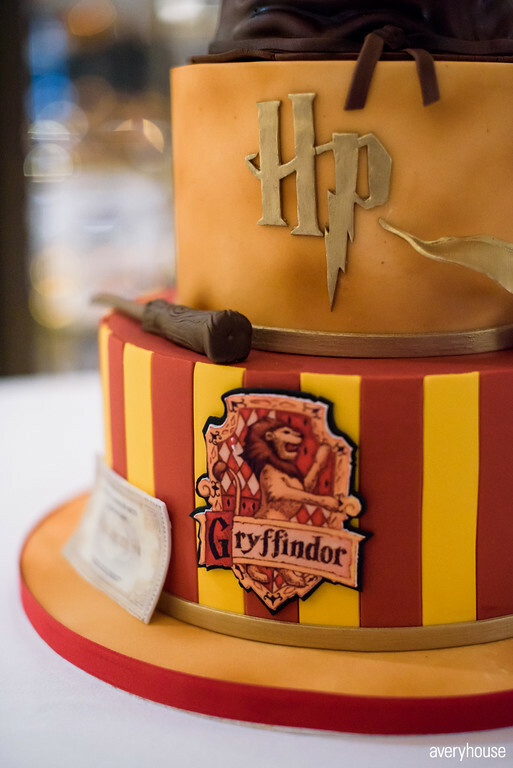 The one above was a birthday cake! 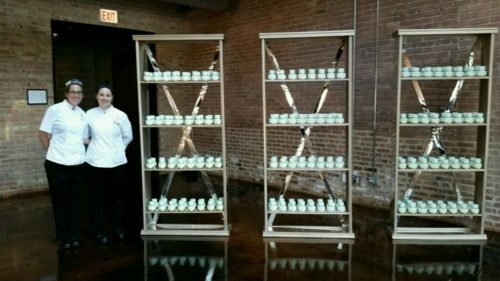 Thanks for taking the time to learn a little about the Elysia Root Cakes team’s head baker! 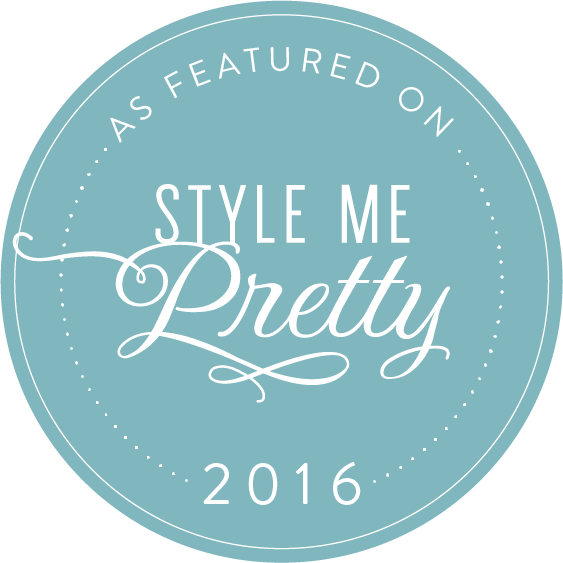 Check out more from Kelly on her instagram and her website. 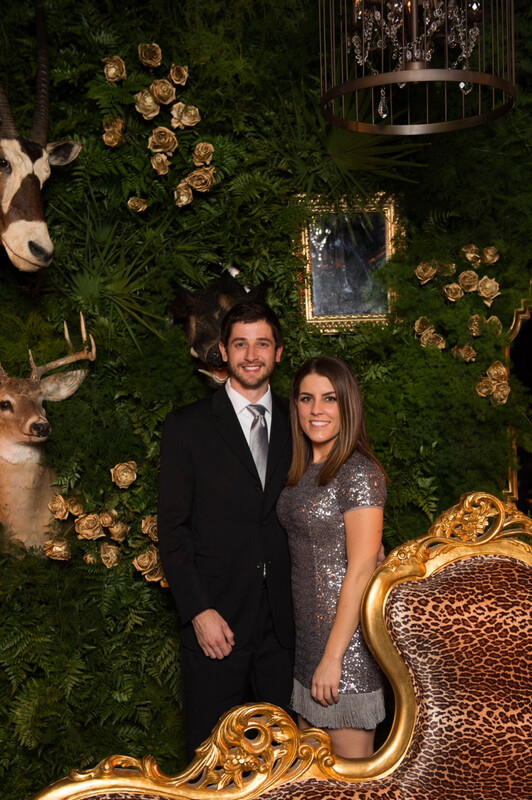 Kelly and her boyfriend, Andrew at the Wish Upon A Wedding Gala. Photo by Studio This Is. 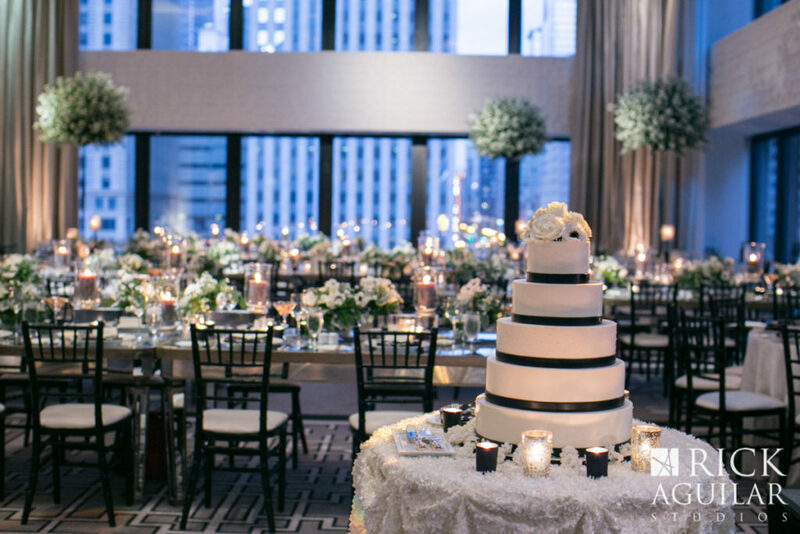 Jessica and Jacob’s wedding at The Langham Chicago was such a beautiful and glamorous affair! 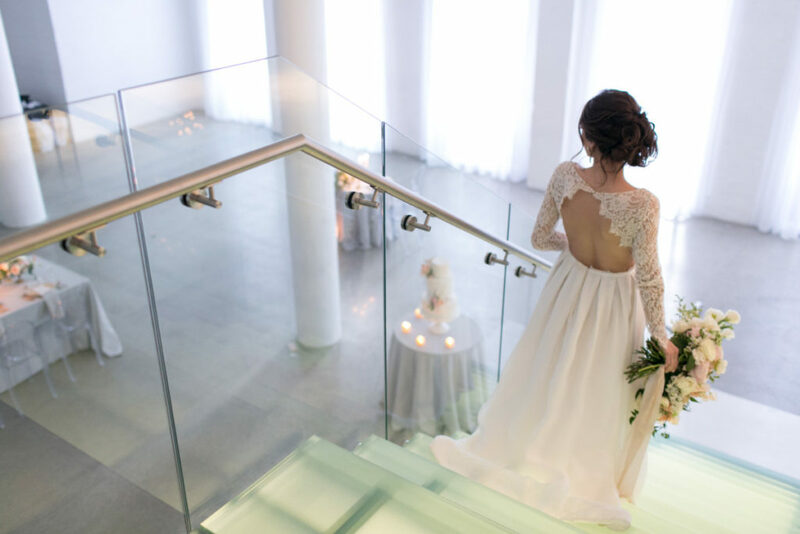 Every time we look back on the details of this amazing day, captured beautifully by Rick Aguilar Studios, we feel so honored that we could be a part of it! 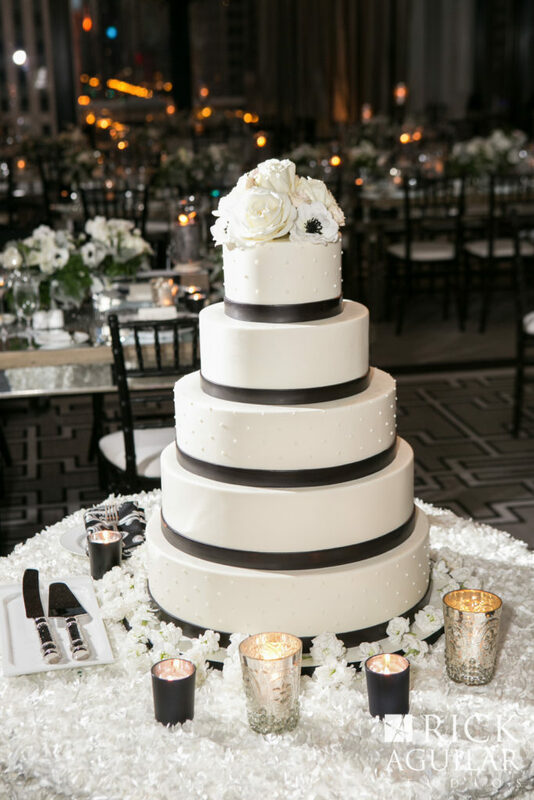 The show-stopping five-tiered cake was adorned with black fondant ribbon and fresh white florals from Kehoe Designs, creating a modern yet elegant design. 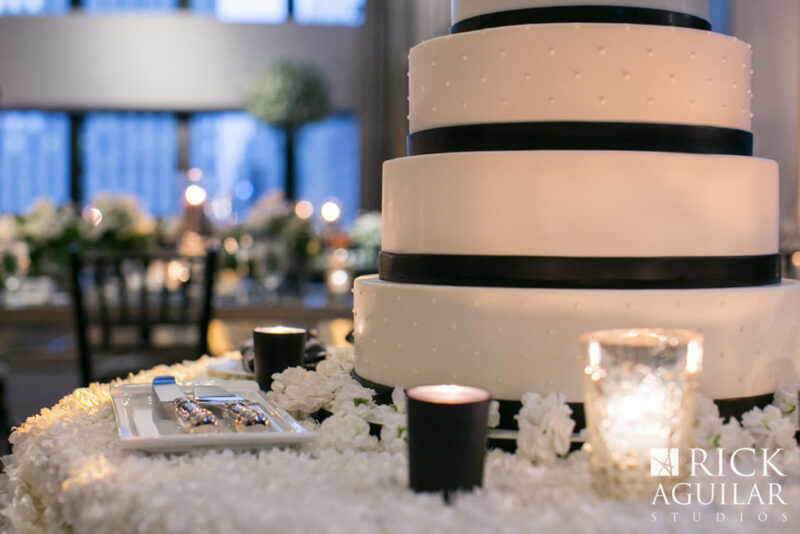 The cake table was draped in a textured white linen which beautifully contrasted the smooth, slick surface of the cake. 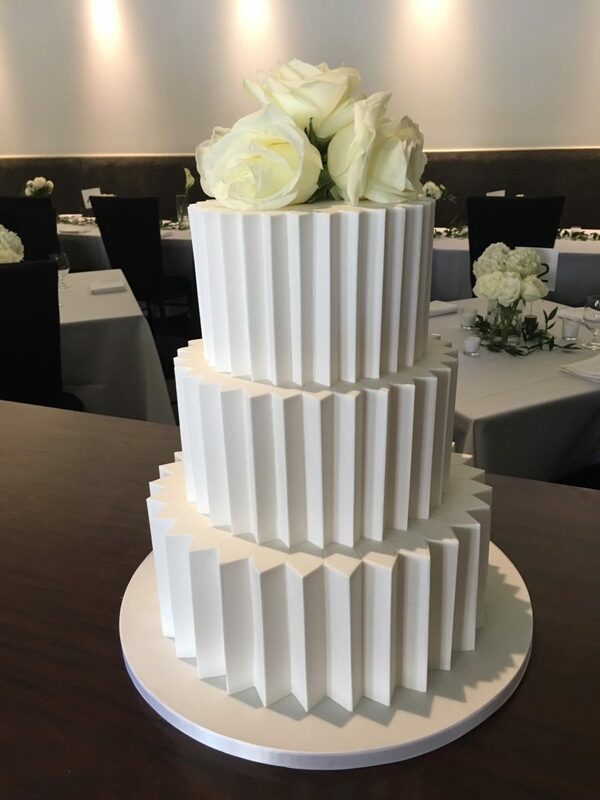 We love a sophisticated and minimal design, and this cake was no exception. 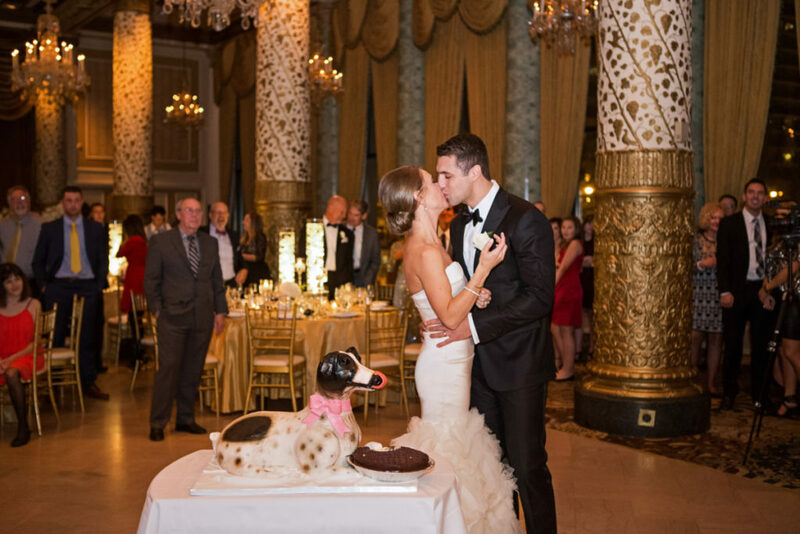 We wish Jessica and Jacob many more days that are as special and happy as their wedding day! 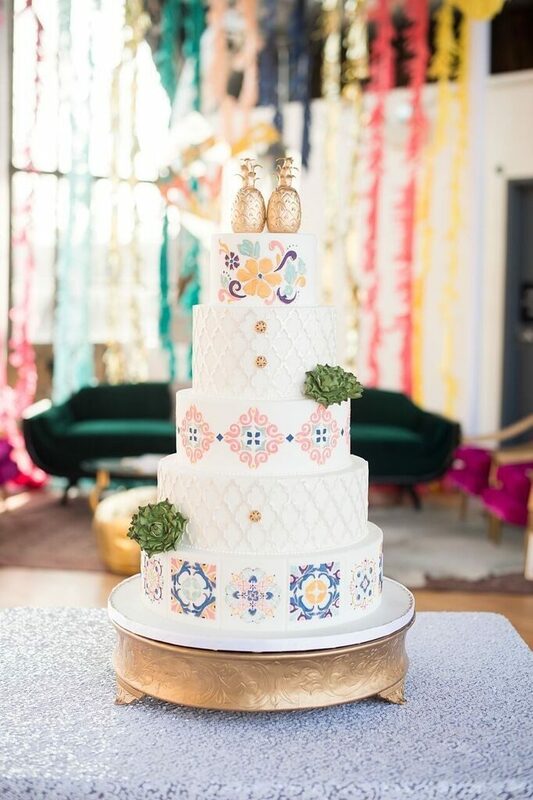 At Elysia Root Cakes, it is our job to keep up with wedding trends, and the hand-painted wedding cake craze is one we can get behind. 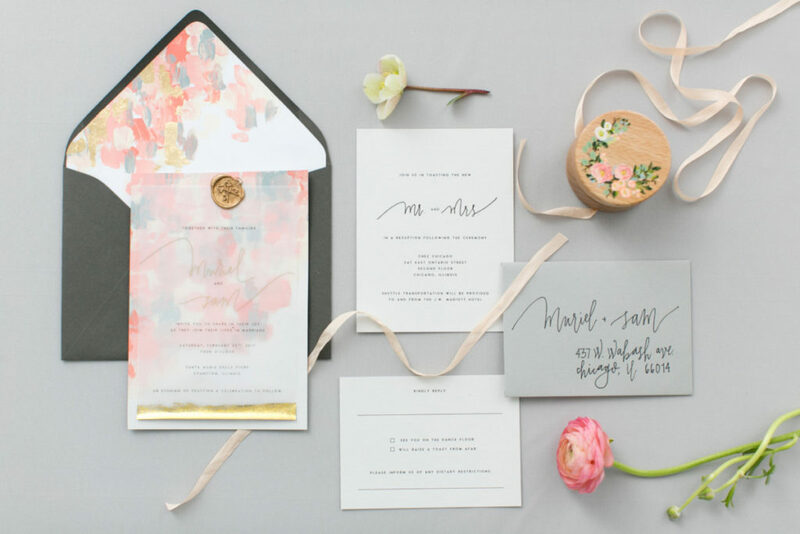 Hand-painting is a beautiful and creative way to bring in elements of your day that have meaning. 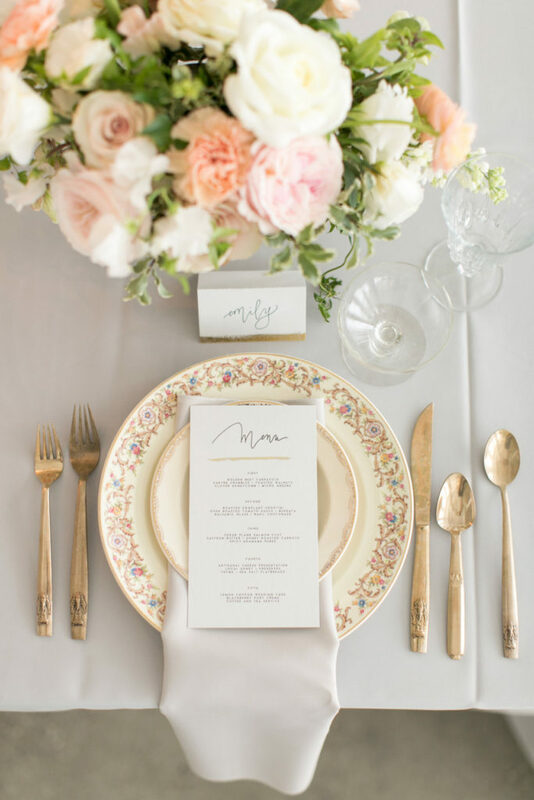 Whether it’s incorporating your favorite flowers, your monogram or your new china pattern, be sure to make it your own! 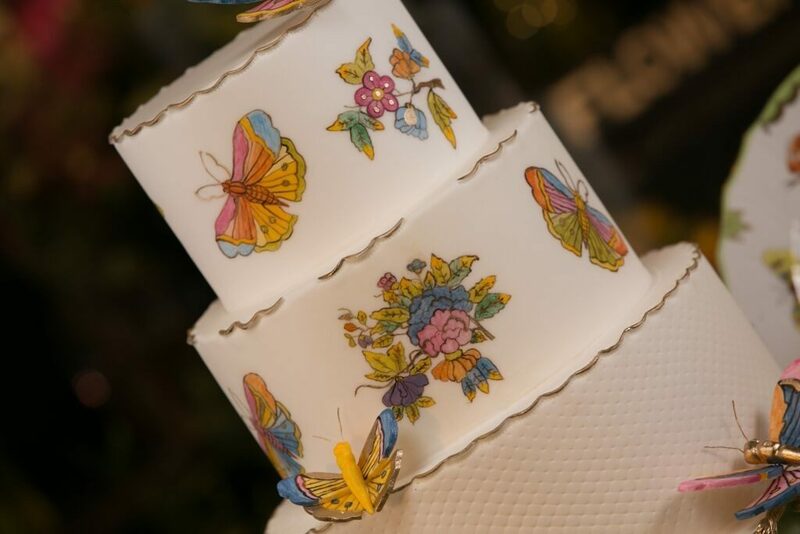 Take a look at some of our favorite hand-painted cakes below! 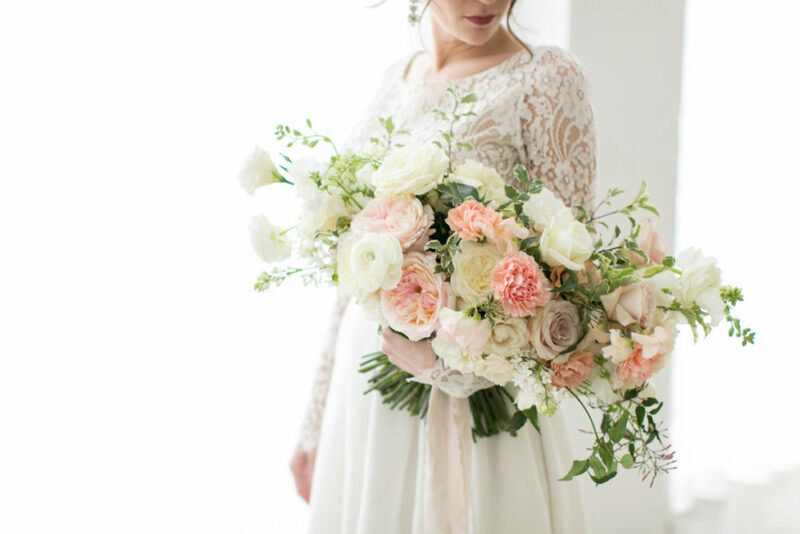 We love being a part of styled shoots – especially this gorgeous Christy Tyler photography workshop shoot. 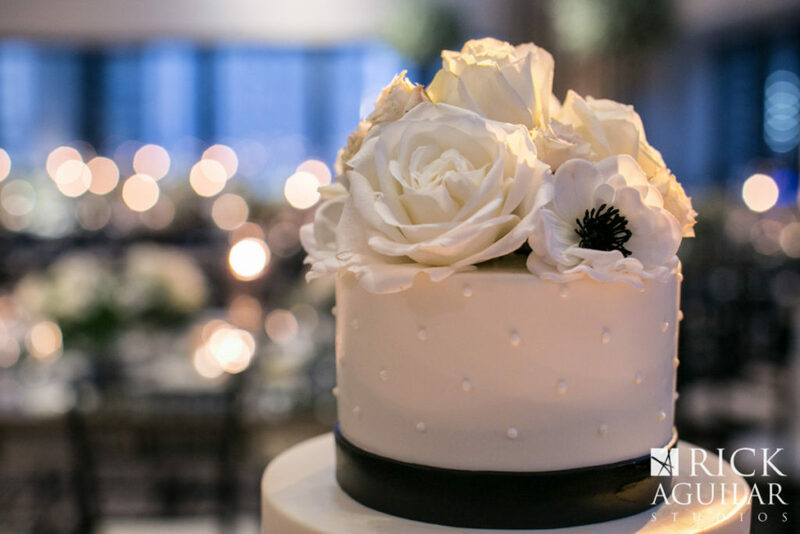 Creating a cake that perfectly complements the design, decor, florals, and bride is a challenge; one that we will always accept! 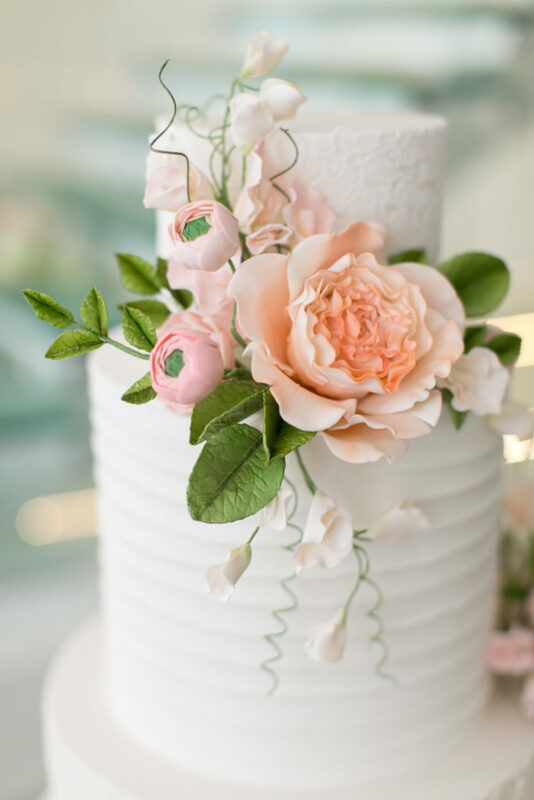 From the pretty pink ring box and flourishing tablescape to the beautiful china, pulling inspiration from all aspects of a shoot is crucial to creating a stunning cake design. 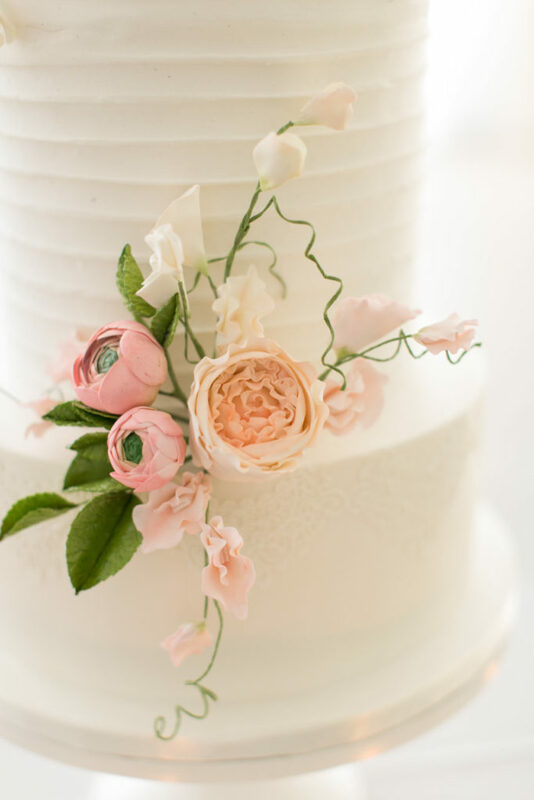 For this shoot a three tiered classic all-white cake adorned with luscious pink sugar florals, greenery and blush flower buds, set the stage for an elegant and romantic affair. 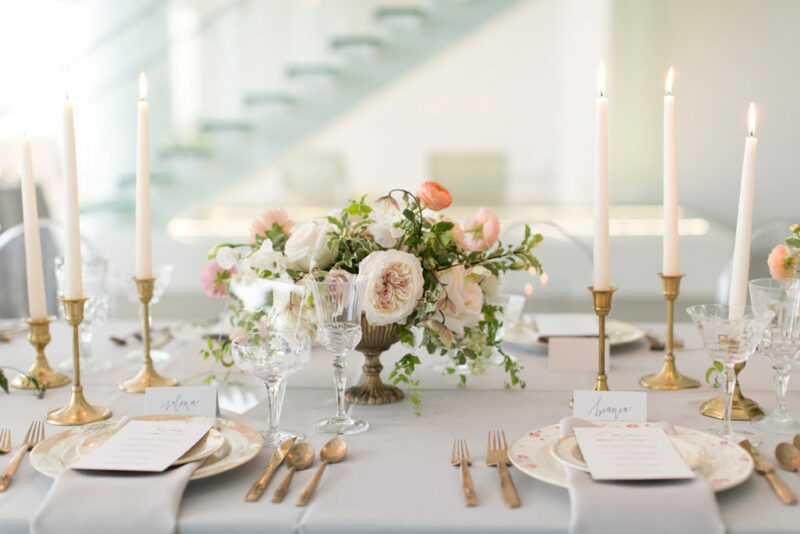 Take a look below at all of the details from this fabulous shoot! 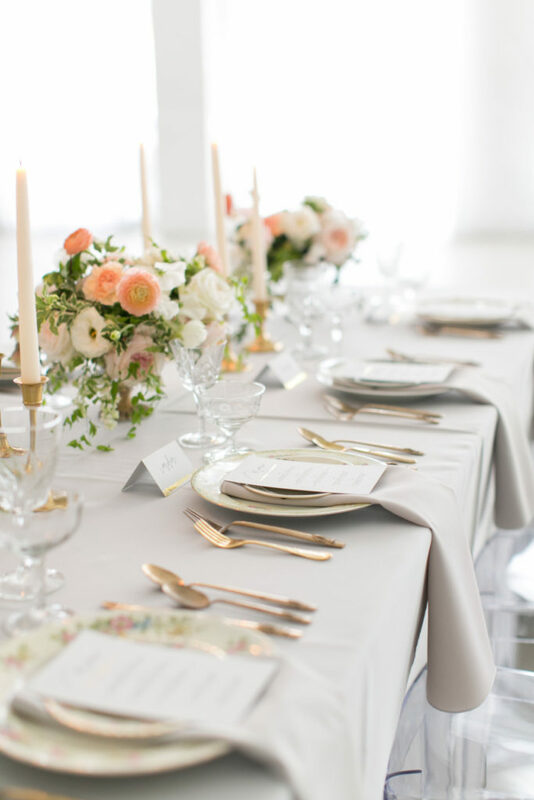 Liz and Joey’s wedding day was a joyous celebration, filled with friends and family! 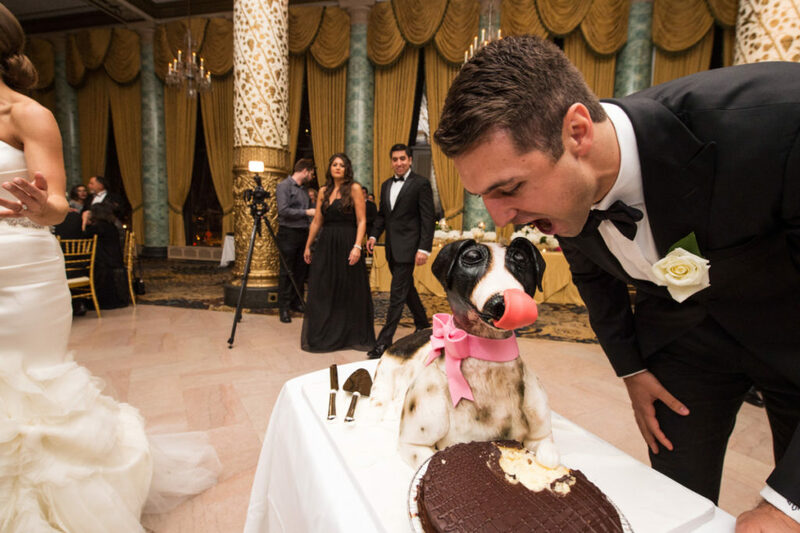 The most memorable part of the day had to be the unveiling of the groom’s cake – Joey was pleasantly surprised to find his best friend turned cake form. 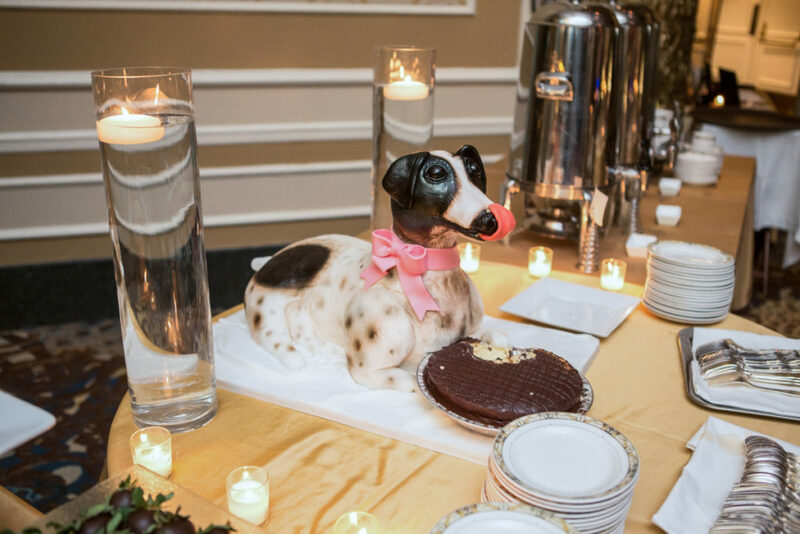 Liz wanted his Jack Russell Terrier, Pebbles, to be a part of their special day, and this was the most creative way possible! Liz arranged for Joey’s favorite Boston Crème pie from Joe’s Seafood to be delivered to us so that we could depict Pebbles getting into trouble by eating his pie! 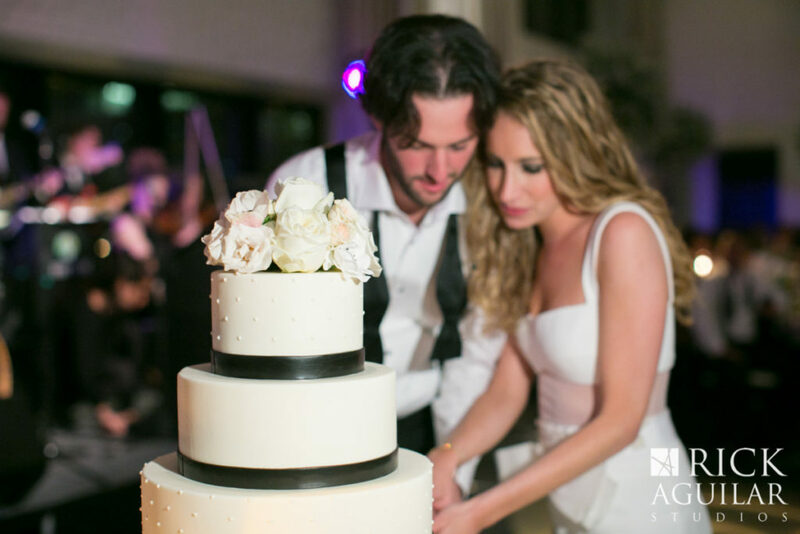 This cake was so much fun to create, and even more exciting to see Joey’s expression when first laying eyes on him! 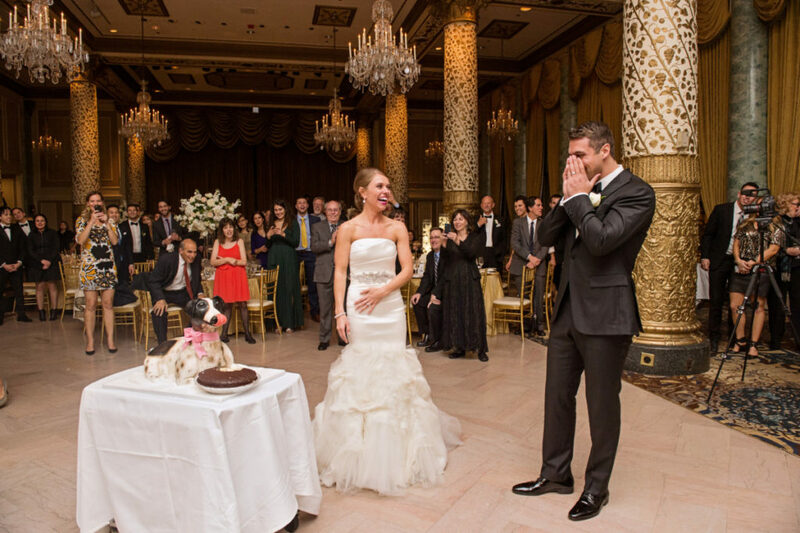 Take a peek below at this one of a kind grooms cake, and Joey’s once in a lifetime surprise!